Software helps to let you know about how to convert contacts.edb file. Wonderful Live Mail contacts converter program assist to convert live Mail contacts to PST, MSG, HTML, CSV, existing Outlook PST, vCard format. Export Live Mail Address Book to PST, MSG, HTML, CSV, vCard and Existing PST file. Auto Detection of Live Mail Address Book location for ease. Option to save contacts to existing Outlook profile. Selective contacts of Live Mail to Outlook PST, MSG, HTML, CSV and vCard (*.vcf). No file size limitation: Convert Any Size of contacts.edb files. 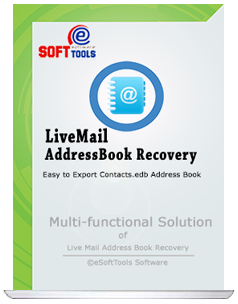 Live Mail Address Book Recovery Program is one of most usable tool to Import Contacts.EDB to PST and for recovery contacts .EDB file and gives multiple choices for Live Mail contacts Conversion. Use can easy to import live mail contact to outlook pst without losing any bit of information. 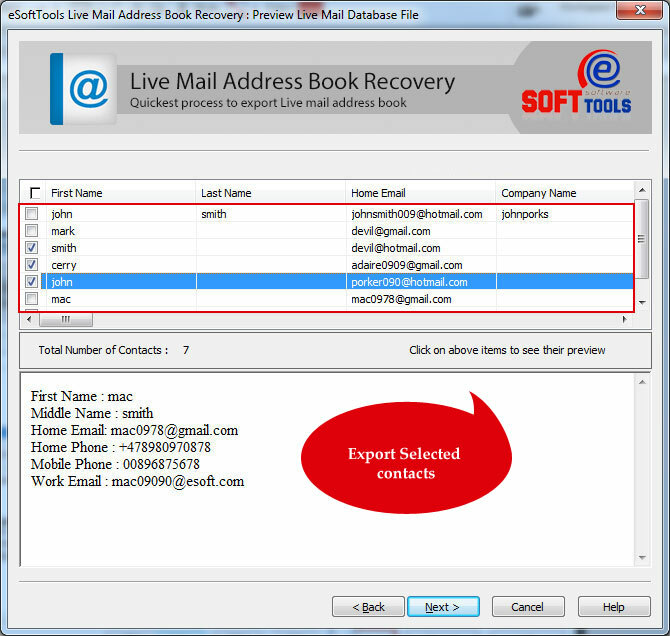 eSoftTools Live Mail Contacts Recovery Software helps to easily and quickly restore live mail contacts to outlook PST, MSG, vCard (vcf), CSV file. 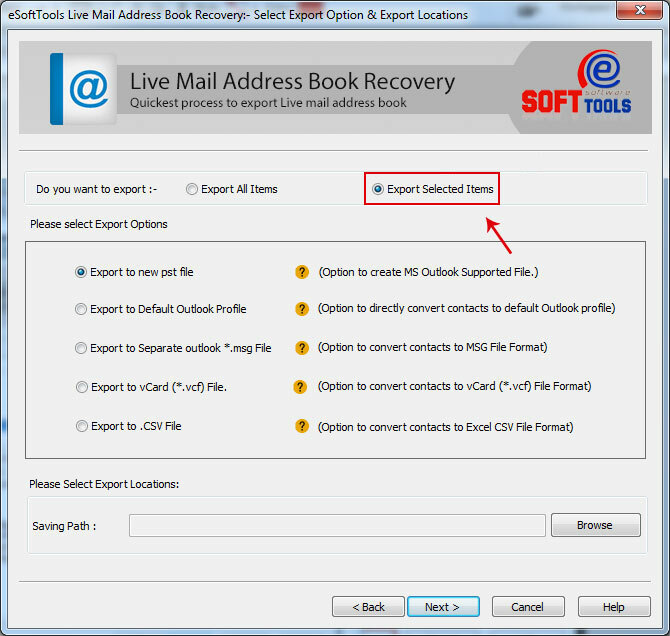 eSoftTools Live Mail Address Book Conversion tool has the ability to automatically detect the location of live mail address book. Choose the option "Select default location of contacts.edb file" and proceed for conversion. Before conversion, software displays the total contact entries which contained in contacts.edb file for preview. User can click on every contact item and see their complete preview and then proceed the conversion process. 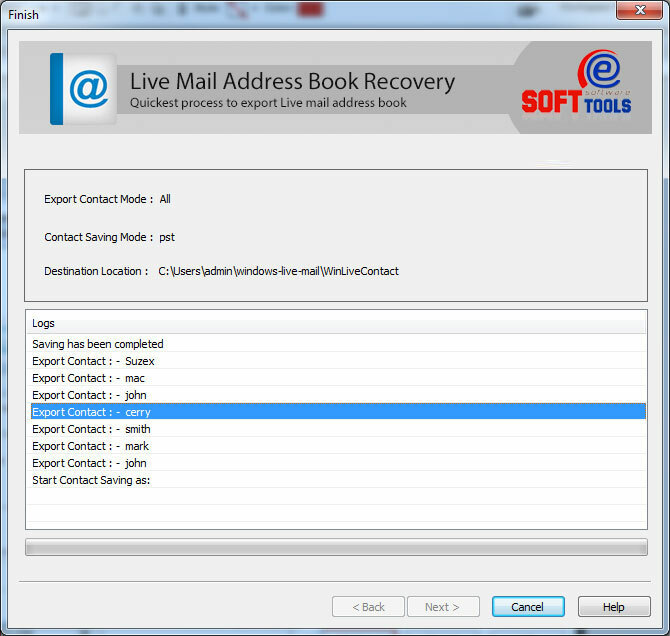 Live Mail Contacts Recovery tool allowed to export selected contact items for recovery. User can select the checkboxes from listed items and go for conversion. For user convenience, software has 2-modes of PST file generation. First is to "Create New PST file" and seconds is "Export to default Outlook Profile". 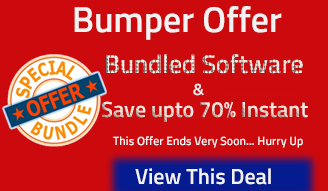 This wonderful conversion solution supports every version of MS Outlook including 32-bit and 64-bit. eSoftTools Live Mail Contacts Conversion tool export contacts.edb file in multiple formats like Live Mail Contacts to PST, MSG, CSV and vCard (*.vcf). Windows Live Mail Address Book Conversion Wizard incorporates a unique, simple and user friendly interface. With detailed info at every step of operation, Windows live mail contacts converter provides an easy-to-use platform to convert Live Mail Contacts to PST, MSG, CSV and vCard. Do i need to have MS Outlook installed, If i convert into PST? Yes, MS Outlook is required for conversion from Live Mail Address Book to Outlook PST file. If you have not installed, then first install MS Outlook and then performing the conversion using eSoftTools Export Live Mail Contacts to Outlook. Is it possible to view contact items prior to conversion. Yes, you can completely view the contact items! Once software loads your contacts.edb file then you can view the preview of contact items. Demo version of Export Windows Live Mail Contacts Software, you can export 10 contacts in each format. I don't know the location of Live Mail Address Book. How can i export live mail contacts? 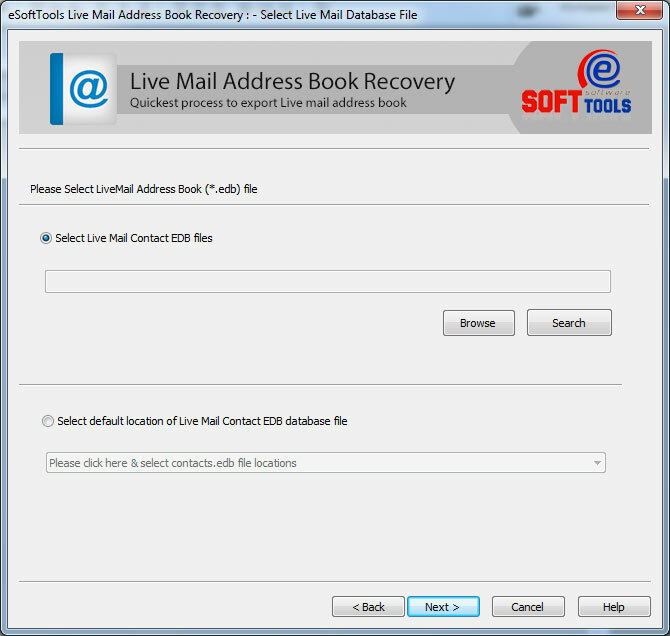 Yes, the software provides an option, Select the option "Select default location of Live Mail Contact EDB file" and you can choose the one you want and proceed with the recovery process. Can i export individual contact item, using this software? Yes, eSoftTools Live Mail Contacts Export tool allows you to convert individual contact item in PST, MSG, vCard or CSV file format. I’m incredibly impressed with the caliber of your software I have worked with - they have proven themselves to be more powerful. This tool has export my live mail contacts to vCard (.vcf) which i need to be import into my phone. Totally exceeded my expectations. Your tool for Live Mail Contacts Exporter went well above my expectations and assisting me how to restore my contacts from contacts.edb file. I easily export contacts.edb to PST format. Amazing work. Your Live Mail Address Book Conversion app is excellent excellent excellent. These tool recovered all my important contact data straight away after trying other 2 software who did nothing.